We build anything from retaining walls to maximize space, beautiful hardscape patios, peaceful sounding water features and much more. We will even plant a single tree no job is too big or too small. EarthTech technicians are licensed, experienced, and trained to build your ideal outdoor space under the direction of our Landscape Designers. Hardscapes, such as patios, pathways, stairs, seating areas and retaining walls, enhance outdoor spaces and can create inviting entertainment areas. 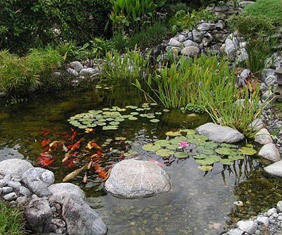 Materials include pavers, flagstone, crushed rock, landscape timbers, concrete blocks, boulders and more. Hardscapes are customized to fit your specific needs and look. Whether you desire ultra modern Architectural Slabs, classic brick, natural stone or a unique combination, EarthTech will create a beautiful place for you to enjoy nature and time with family and friends. We are licensed and bonded and have an extended warranty on all construction we perform. Water conservation is likely to be the single most important aspect in the future of Landscape Maintenance. EarthTech irrigation renovations result in the reduction or elimination of water run-off, which conserves the life of building surfaces and parking lots. 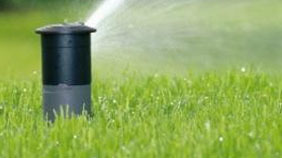 By carefully going through your system, adjusting, relocating or eliminating heads and changing nozzles, we can also save on your water bill, by ensuring water is placed only where desired. Inefficient “overhead spray” irrigation can be converted into efficient drip irrigation systems, which, when properly installed, eliminate wasted water. Point source drip irrigation is especially useful in landscapes utilizing plants with differing water needs, because water is delivered to plants on an individual basis and can be controlled by adding or removing emitters. This is also a perfect choice when retrofitting an existing landscape. 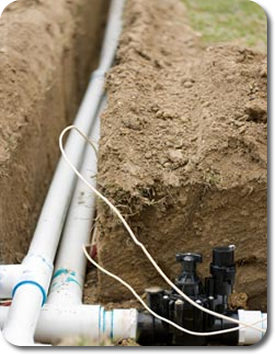 In-line drip irrigation systems are an excellent choice for annual beds or garden plots as water is expelled at specific intervals (6”, 12”, 18”, etc). EarthTech can evaluate your landscape and recommend the best system for your needs. “Smart” irrigation controllers (solar powered available) apply water based on current ET (evaportranspiration) rates, which delivers the precise amount of water needed to keep plant material vibrant and healthy throughout changing seasonal weather patterns. With all the advances in irrigation technology, chances are your current system is either outdated or could use a tune up.